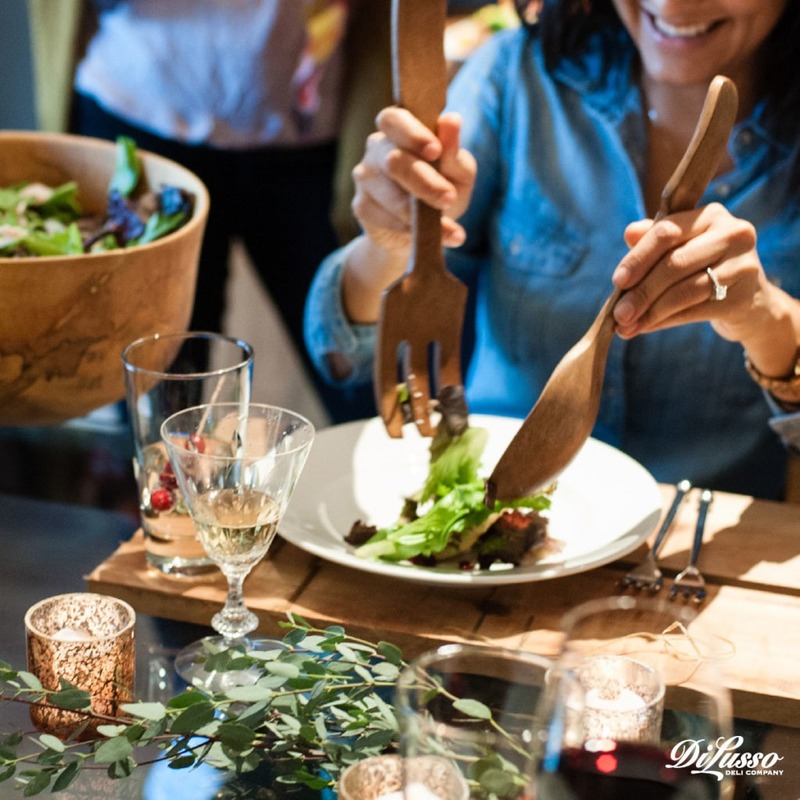 While we all look forward to that fourth Thursday of November, marked by those oh-so familiar aromas coming from the kitchen and hugs from distant relatives, there may come a time you can’t make it home to the big table. Maybe there are too many miles between you, or a job that’s gotten in the way. Or maybe you yearn for something simpler, with a little less drama. And a little more wine. Friends are the family you chose. Maybe even a closer family. Thanksgiving is the best holiday of the year to be with people you really want to celebrate with. While it’s a wonderful time to catch up with family and enjoy cherished memories, it’s also a wonderful time to make new memories with your closest of friends. So just how does Friendsgiving work? The only rule in this non-traditional celebration is that there are no rules. 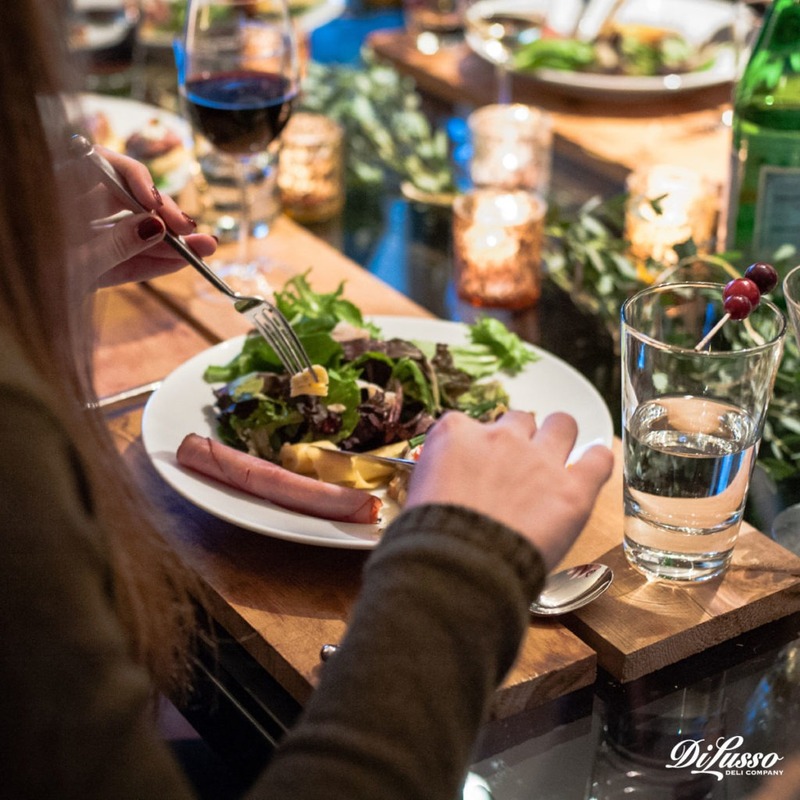 It’s as individual as each of the friends gathered around your table. Sometimes the host will be in charge of a main dish. Turkey or ham devotees can choose their favorite. But more often, it’s an anything-goes, eclectic potluck of favorites and sensational sides. After all, the element of surprise is half the fun. It’s really a glorious way to put together an amazing array of delectable dishes. Trust us, no one ever leaves hungry. 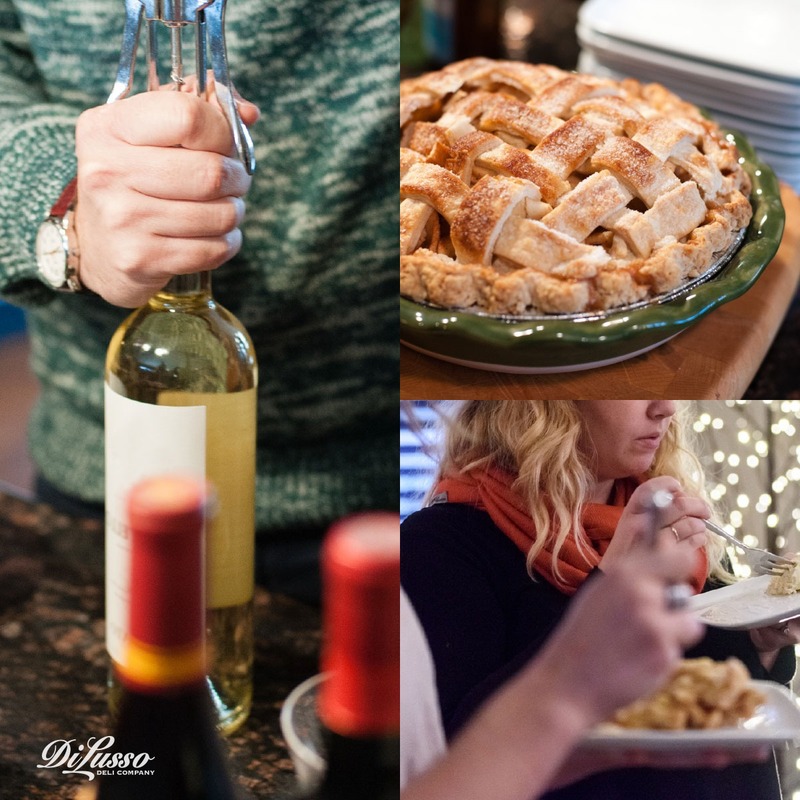 Friendsgiving is much more than a bring-your-own-dish buffet. It’s a wonderful opportunity to share favorite recipes that have been handed down over generations in your own family. What a beautiful way for those meaningful traditions to live on in a fresh, new way. Caitlin may bring her mother’s secret ingredient stuffing and Allie, her grandma’s killer mashed potatoes. The bakers of the group are sure to have everyone’s sweet tooth covered. The surprise of how the menu comes together is half the fun. From oven to table, Deborah’s Harvest Tian is as gorgeous as it is delicious. And surprisingly easy to create! She starts with a large yellow onion and two garlic cloves, both finely chopped and sautéed with a tablespoon of olive oil stovetop in a dutch oven pan. She likes to use a mandolin to cut beautifully thin slices of Yukon gold or baking potatoes, sweet potatoes and yellow squash, then arranges them on top of the cooked onions and garlic in a pinwheel pattern by alternating colors. A quick drizzle of olive oil on top with a sprinkle of herbs de Provence and it’s ready to bake for 30 minutes, covered, in a 400 degree oven. 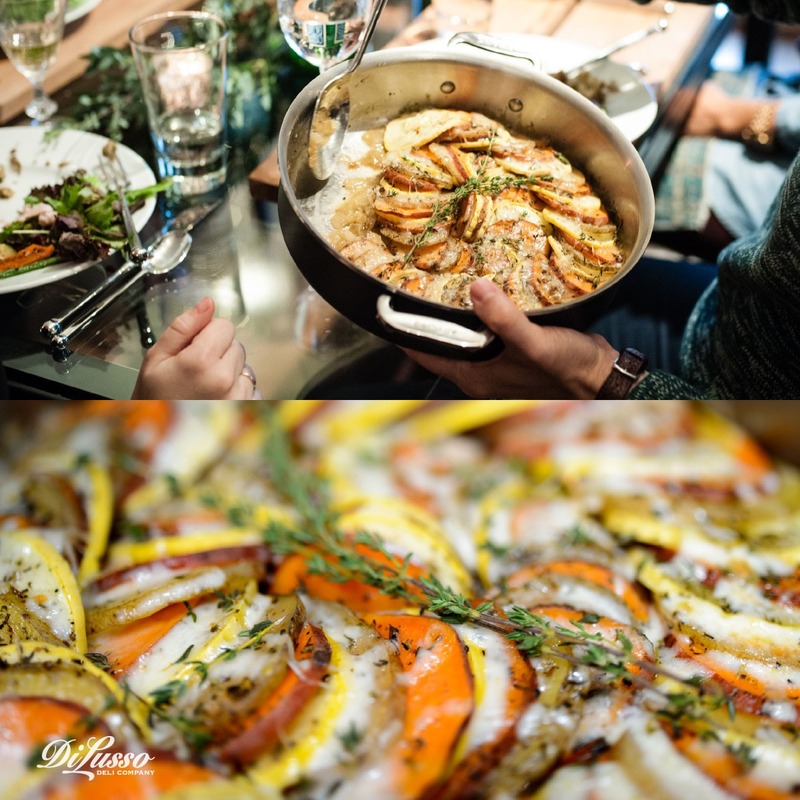 Remove from the oven and top with grated Parmesan, a few slices of our habañero jack cheese and return to oven uncovered for 15 minutes or until the potatoes are thoroughly cooked. Deborah loves serving her Tian with fresh springs of fragrant thyme. We like to get the party started long before everyone sits down to the table. And the kitchen is where it’s at. Laughter, hugs, conversation, wine – everyone’s so excited to catch up and eager to pitch in with last minute details. Preparing a holiday meal is way more fun with a teamwork approach. Though it doesn’t look like much work is going on! Gabe’s Harvest Crostinis are already getting nibbles! That’s what happens when you combine ham, Havarti and apricots on warm and crunchy baguette. Bursting with fall colors and fresh flavors, our Harvest Salad makes a delicious side to share and a tasty way to add some green to our plates. There’s something for everyone in our bountiful Harvest Platter. 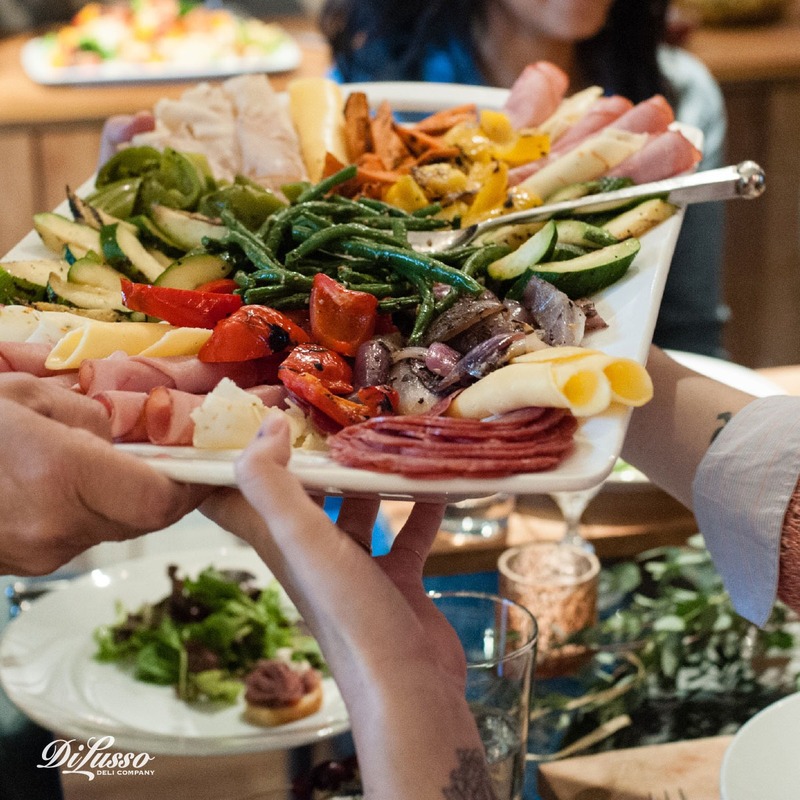 With beautifully arranged our meats and cheeses, roasted vegetables, it’s perfect for gathering in the kitchen as well as passing around the table. There’s just something about passing plates and platters around the table, holding that heaping bowl of Sonya’s mashed potatoes while the person next to you dishes it up, that creates a bond. When we break bread together, we’re instantly connected. It’s a time to turn off all of our distractions and truly enjoy each other. New friends, old friends. Isn’t this what giving thanks is all about?